For decades, distinct professional wrestling territories thrived across North America. Each regionally based promotion operated individually and offered a brand of localized wrestling that greatly appealed to area fans. Promoters routinely coordinated with associates in surrounding regions, and the cooperation displayed by members of the National Wrestling Alliance made it easy for wrestlers to traverse the landscape with the utmost freedom. Dozens of territories flourished between the 1950s and late '70s. But by the early 1980s, the growth of cable television had put new outside pressures on promoters. An enterprising third-generation entrepreneur who believed cable was his opportunity to take his promotion national soon capitalized on the situation. A host of novel ideas and the will to take chances gave Vincent Kennedy McMahon an incredible advantage. McMahon waged war on the territories and raided the NWA and AWA of their top talent. By creating WrestleMania, jumping into the pay-per-view field, and expanding across North America, McMahon changed professional wrestling forever. 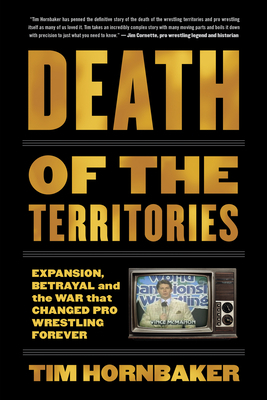 Providing never-before-revealed information, Death of the Territories is a must-read for fans yearning to understand how McMahon outlasted his rivals and established the industry's first national promotion. At the same time, it offers a comprehensive look at the promoters who opposed McMahon, focusing on their noteworthy power plays and embarrassing mistakes. Tim Hornbaker is the author of eight nonfiction books, including National Wrestling Alliance: The Untold Story of the Monopoly that Strangled Pro Wrestling and Capitol Revolution: The Rise of the McMahon Wrestling Empire. His biography Turning the Black Sox White was nominated for SABR's Larry Ritter Award and the Seymour Medal in 2015. He lives in Tamarac, FL, with his wife, Jodi.